Volkswagen has been on a roll smashing automotive-themed world records. The German automaker broke the land speed record with a modified Jetta GLI, set a hill climb record and Pike's Peak with the electric ID.R, and delivered more cars than any other automaker in history with 10.83 million units sold in 2018. VW wants everyone to know that setting records isn't a new phenomena and that it's been doing it for several decades. To show off its accomplishments, the company is staging three exhibits at the world’s largest fair for vintage cars, the Techno Classica. The exhibits will be open from April 10-14 and display six record-breaking cars from three different decades. The newest car of the bunch (and our personal favorite) is the W12, which set ten international records at the high-speed circuit in Nardò, Italy. This mid-engine concept car produced 591 horsepower and could achieve a top speed of 211 mph. The car was able to set a 24-hour average speed record of 200.63 mph, which it still holds today. Other models in the exhibits include a 1988 two pilot-series Corrado G60, which set six class records at Volkswagen's test facility in Ehra-Lessien; a three-wheel prototype that completed over 926 miles on a single liter of diesel; and a Lupo 3L TDI that completed a 33,333-kilometer journey through 22 countries, earning it the record as the most economical production car in the world. The exhibit will also display the 1974 Golf I "Alaska-Tierra del Fuego" and a second bright-yellow Golf I, which are among the oldest production Golfs in existence and completed the longest test drive ever taken by a new car, almost 1,900 miles from Fairbanks, Alaska to Ushuaia, Argentina. 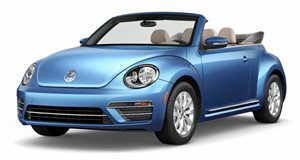 Finally, VW will show off the Beetle 1302 S "World Champion," which became the most mass-produced car in history on February 17, 1972.